In a world first, a healthy baby has been born using a "safer" method of the infertility treatment IVF. 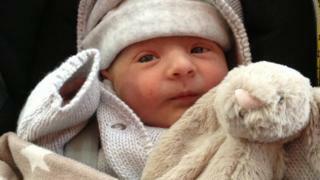 Baby Heath - who is now nearly eight weeks old - was conceived using a natural hormone to kick-start his mother's ovaries. UK doctors at Hammersmith Hospital and Imperial College London say their pioneering "kisspeptin" treatment could help many other women. It avoids a rare but fatal complication seen with conventional IVF. Experts welcomed the breakthrough but warned it would be years before the treatment became widely available. Studies in more women are needed. About one in every 100 women undergoing usual IVF treatment will develop a severe form of a medical condition called ovarian hyperstimulation syndrome or OHSS. Instead of producing a few eggs as desired, the ovaries go into overdrive and produce lots in response to the potent fertility drugs. While most women with OHSS will have mild symptoms and recover, those few with severe OHSS become very ill and can die. Doctors are always on the look-out for warning signs of OHSS and keep a close eye on the tens of thousands of women who undergo IVF each year in the UK. Now UK experts say they have found a way to make IVF safer by using kisspeptin. Lead researcher Prof Waljit Dhillo, from Imperial College London, and Dr Geoffrey Trew, who runs an IVF clinic at London's Hammersmith Hospital, have carried out the first human trials of this new fertility drug. The early results in 30 women show kisspeptin can be used to stimulate egg release in a gentler, more natural way. Kisspeptin worked in 29 of the 30 women and 28 of the women were then able to use their eggs to attempt IVF. So far only one baby - a healthy boy called Heath - has been born. Heath's mother, Suzie Kidd who is 34 and from Hitchen, says she is ecstatic that she was chosen to take part in the trial. "We already have one son, Lochlann, through IVF on the NHS so I didn't think we could be that lucky again. "We are so, so grateful." When asked if, in the future, she would tell Heath about his importance to medical science, she said: "I guess. I wasn't really aware it was a big deal." Dr Trew said: "We're absolutely thrilled that this study has resulted in the birth of a healthy baby boy. "Each year, thousands of couples in the UK start families using IVF treatment and if we can work towards eliminating the risk of OHSS, using the naturally occurring hormone kisspeptin, we can hopefully help even more women and make the treatment potentially safer." When the researchers finish their current study this summer they hope to begin bigger trials in patients at high risk of OHSS. Prof Richard Fleming of the British Fertility Society said experts have been striving to make IVF less risky, although it is generally a safe procedure. "What's been the conventional treatment for the last 30 years is risky. This looks like another way to make the whole IVF process safer." He said it was too early to recommend kisspeptin routinely as more trials were needed. "If women are concerned, their doctor can explain the risks and merits of IVF and recommend what is the best treatment. There are patients who are far better treated with conventional IVF." The study was funded by the Medical Research Council UK and the National Institute for Health Research and the results are being presented this week at The Endocrine Society's annual meeting in San Francisco, California.